A monster catfish was caught by a fishing net cast by the two local fishermen in South Korea's Cheongyang on April 27, 2018, local news media reported recently. 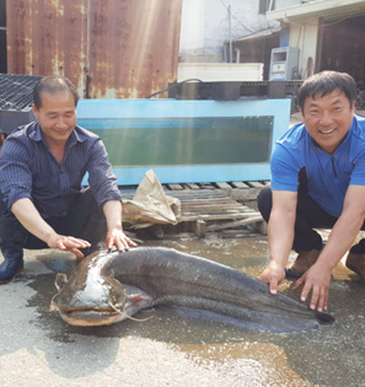 The 135-cm and 38-kg catfish was netted in the Geumgang River at Gamagol, Hwangyang-ri, Mokmyon in South Chungcheong Province's Cheongyang County on the day. It is one of the largest catfish caught recently in South Korea. Massive catfishes are often found in the rivers of South Korea. "I spent the whole 70 years of my life around this Geumgang River area, and this is the first time to catch this huger fish," the fisherman Bang Ho-Gyeong was quoted as saying. "It was caught by me while it was moving to the spawning ground in the shallow water to lay their eggs"
Normally, the spawning season for catfish here in Korea is known between May and June. Catfish are known to favor the bottom areas of the pond or the river where the water flow is slow. Nocturnal catfish prey on small victims including crustaceans and aquatic insects. "I believe the big catfish is the result of our refraining from using pesticide in farming," Bang added. Bang is the village chief.